Sword of Mana marks a critical change for the Mana series, as it makes its return to a handheld system. While the series may have its origins on the Game Boy, the series only became legendary and earned its place in the hearts of gamers with Secret of Mana. To me, that’s when the series officially became the Mana series, with all of the weight that label carries. 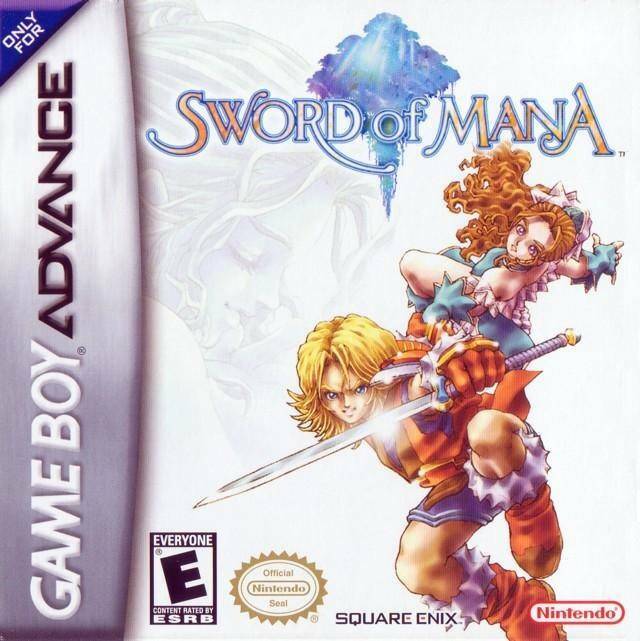 With the decision to release on the GBA, Sword of Mana becomes the fifth game in the series and the first on a handheld with the gravity and significance of the Mana moniker. 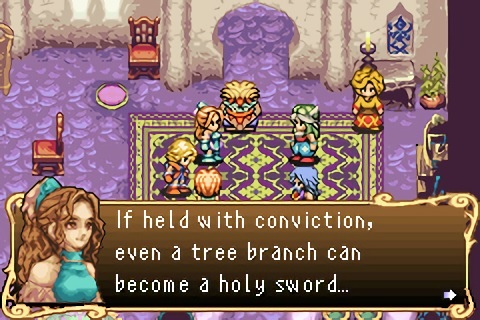 Sword of Mana is a story that takes place twenty years after the defeat of an evil king, Vandole, who abused Mana power for his own tyranny. Three holy knights, wielding the Sword of Mana, defeated Vandole and ushered in an era of peace. Since that time, the use of Mana has been forbidden, which results in personal tragedy for a man called Dark Lord. Having wanted to use Mana to save his mother, Dark Lord is now on a revenge fueled warpath against any Mana clansmen, while also wanting to release Mana back into the world out of pure anger and spite. The main hero and heroine must stop Dark Lord and his cohorts, including the mysterious Julius who seems to relish the idea of a new dark age, from repeating the calamities of twenty years prior. 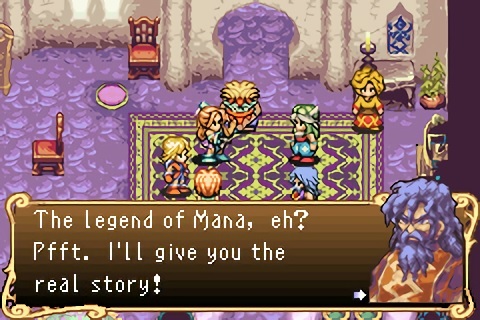 Sword of Mana’s storytelling, while not perfect by any means, is still of note due to many flashes of greatness, with moments of strong writing and emotionally inspiring events scattered throughout. The majority of the game’s plot is delivered through dialogue between the two main characters, the main villains, and several important side characters that journey with the heroes. Much of the backstory is filled in as the villains and side characters reminisce about past struggles and current conflicts. While some of the writing for these conversations is strong, there are other times when the dialogue can be a bit long-winded. While I appreciate the detail and depth that the devs were striving for throughout, there are instances when the dialogue is either dry, stretches too long, or lacks an emotional weight behind it. Scenes that need to drip with grief and heartbreak or burst with passion fall short to convey the depth of emotions needed to make a desired impact. This has a tendency to disrupt flow and player immersion, but fortunately it’s never enough to break it completely. Also, those times of successful execution are very much worth experiencing. It’s because of these successes scattered throughout that I’m left wanting so much more. 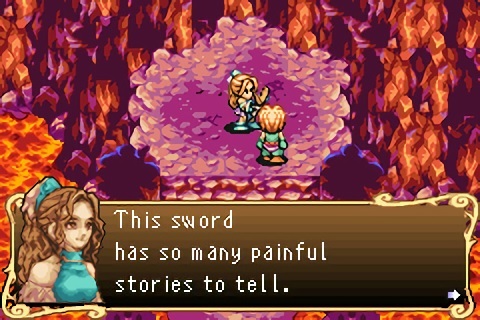 As I said before, Sword of Mana has several instances that demonstrate a remarkable emotional depth. Before its merger with Squaresoft, Enix was known for implementing darker, more serious tones to its plotlines. That darker, almost tragic tone is seen here and those moments are especially memorable. From the loss of close friends to the irony of actions taken, this game is hardly a fairy tale. Sacrifice, loss, and bittersweet victories define the style of this story. Narrations, usually played just after important events, speak of the rage and heartbreak felt by the characters from what just unfolded. Dialogue that conveys loss, hopelessness, and want for vengeance spurns the characters further towards a grim, fateful end. As Enix had done in the past, the actions of these characters carry tremendous consequences, just as in real life. It serves the plot incredibly well, as it counters the narrative missteps, but, more importantly, adds depth and invokes a far wider, more palpable range of emotions for us to experience. 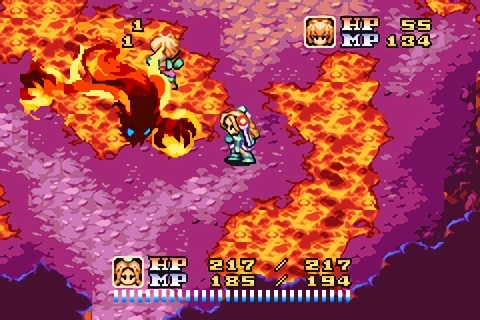 Aside from its story, Sword of Mana features a multi-faceted gameplay structure. Starting with the major component, combat, Sword of Mana borrows mechanics from previous Mana games while adding new functionality. Melee and magic comprise the majority of combat, as both characters can collect a set of nine different weapons with individual attributes. Broken down into slash, bash, and jab types, each of the weapons has its own rate and range of attack. Despite the variety, some weapons have such awful rate or range that they will only be used sparingly, until a better one of the same type is acquired. Enemies are susceptible to different types, so using at least one slash, bash, and jab weapon is necessary. Fortunately, at least one of each type has both a fast rate and a three hit combo to take advantage of, so by the end you would have found your three favorites. Combat itself is real time and never gets too repetitive, with both the ability to swap weapons and with the ease and variety of using magic in combat. As for magic, its use is broken down into support and attack. Tapping the R button activates the support effect. These change depending on the sprite equipped. For example, Wisp, the light spirit, has the support effect of restoring HP while Salamander, the fire spirit, can give a power boost. Holding down the R button until the sprite appears on screen will cause a magic attack to launch. All the attacks work the same, in that they all launch according to the weapon equipped. Wisp will do light damage, Salamander fire, etc. Since each enemy has its strengths and weaknesses, switching sprites may give you an upper hand. The overall execution of this magic system is excellent, with its simplicity and its fast rate of use. I criticized the magic system from Children of Mana because of its slow rate and cumbersome method of switching sprites. Here, support and attack is determined by a tap versus a hold and switching sprites is a quick as opening the menu and choosing. Another gameplay mechanic of note is the class system. Similar to the job system from Seiken Densetsu 3, after every level gained, players can choose a type to level up, influencing which attributes increase. If certain types are chosen and leveled up, your character’s overall class will change. There are many classes to fit many play styles, so it’s highly recommended you begin the game knowing which mastery class you ultimately want for your character. Using a guide helps greatly, as you need to level up the correct types exactly to achieve the desired class. I am impressed with how much of an influence the class system can have on gameplay, as it affects how easily certain enemies are dispatched. Focusing on magic classes will help against magically weak enemies, but then magically resistant enemies become a greater threat. The same is true for physically resistant enemies if you focused on physical power. This also adds to replay value, as you will discover the pros and cons of the different classes and how significant their impact is on gameplay. The forging system from past Mana games also makes a return here. Raw materials, found throughout the adventure, can be used to upgrade weapons and armor. Forging reworks your equipment with new materials and usually provides a sizable stat boost. Tempering uses the same raw material, as well as vegetables and fruit to further increase stats. However, these stats are lost when forging with newer, better raw materials. While I appreciate the benefits of forging, with the increases in stats it provides, I found that tempering can be ignored completely if you don’t want to bother. Perhaps if the bonuses to tempering were similar in benefit to forging, then it would be of greater note. There is also a time system implemented in Sword of Mana. Outside of towns, as you move from one screen to the next, the day will progress into night and so on. While the time system doesn’t play a huge role, certain quest related NPCs or a select few special enemies will only appear during a certain time and/or day. Days will also impact which fruits and vegetables will grow in the orchard. For example, combining a small seed and a crooked seed on an Undine day will grow a Citrisquid, but on a Dryad day, this same combination will grow a Spade Basil. While everything I just covered can seem overwhelming to newcomers, Sword of Mana has you covered with two items that are sold by Niccolo early on. One is Poipoi’s Notebook, a collection of all the information you would ever need about the game. Enemy stats, support magic, how to grow produce, forging, etc., all the information you need to master this game is found in this item, sold right before leaving the very first village. The second item is Cactus Essence. This allows you to grow a hot house, which contains a forge and an orchard for growing. These two items provide a wealth of aid to players and are packaged in a simplistic, unintimidating way. Finally, there are the side quests, thirty three in all, throughout the game. Side quests will net you cash or items, some of which are both rare and very useful. Side quests are given by NPCs by simply talking with them and agreeing to their requests. While rewards like Dudbear’s gold and geodes for additional magic sprites are great, most of the rewards are negligible and none of the side quests influence the story in any way. Also, many of them simply require collecting items or finding additional NPCs to speak with, so they can get dull or tedious very quickly. While gameplay takes up the bulk of a player’s attention, the most appreciated aspects I took away from Sword of Mana are its aesthetics. I absolutely love the look, sound, and encompassing feel of this game. The landscapes are lively, colorful, and beautifully distinct. It gives the impression of the vastness and diversity of a world waiting to awe. The towns and cities all have this homely, handmade feel to them, fitting right in place in this fantasy world. It all looks and feels like a collection of paintings ready to reveal their magic to you. The main characters and enemy sprites are nicely detailed and reminiscent of past Mana games. Innovation and nostalgia come together to fill in these environments with activity. The soundtrack is equally amazing, providing vigor and energy to the many plains, caves, and castles that await. From the upbeat bright melodies that play as you cross grass covered fields, to the slower sorrow filled themes that make the tragedies all too real, each track fits its area and event perfectly. My only complaint, just as in Children of Mana, is that I wish the tracks were longer and there were more of them. I only mind tracks being reused when they are too short and the looping becomes obvious. It takes away from the original magnificence of them. Longer tracks or more of them could have alleviated this one minor complaint of mine. 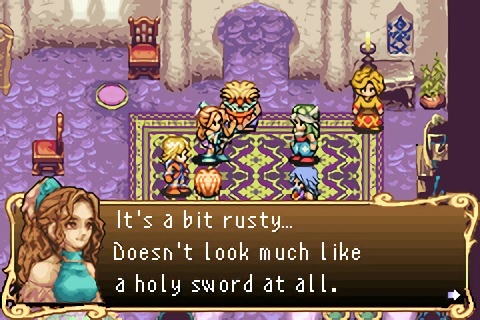 Overall, I really enjoyed playing Sword of Mana. While not perfect, there is plenty of fun and charm to be enjoyed. Its aesthetics are incredible and both its gameplay and story have their moments of brilliance. With these pros, along with the choice of two main characters, the game’s replayability is also noteworthy. If I could, I would rate this game a 3.80 out of 5. It’s doesn’t quite break into that 4 category for me, but it more than earns the score I can display. 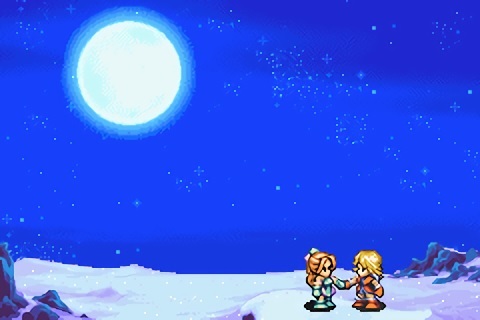 In its entirety, the experience of Sword of Mana is both fantastic and memorable and I very much recommended it to all fans of the Mana series.